81% of shoppers report that they research online before they make a purchase. Activate your brand on social media. Optimize brand value by driving more meaningful and measurable conversations. 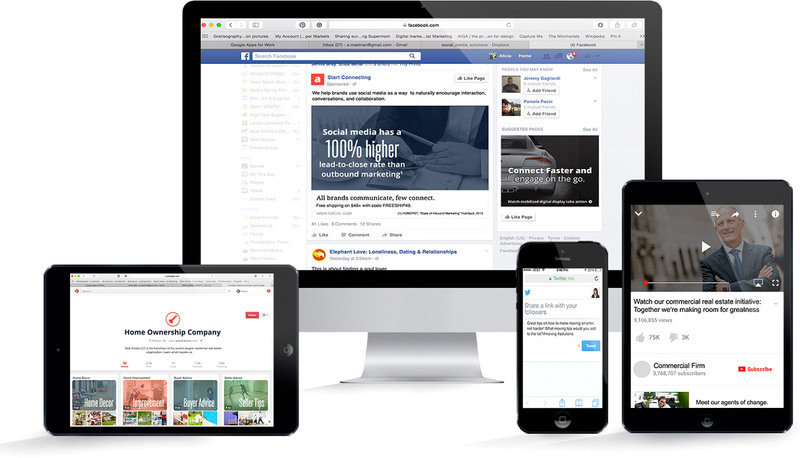 ADvantage can help you to extend your display advertising campaign onto social platforms to increase reach and frequency in front of your target audience. Paid social advertising on Facebook, Instagram and LinkedIn allows your business to control and measure your social interaction with a specific, targeted audience. As a business, you should be maintaining and nurturing social conversations with your loyal customers. However, organic interaction is not enough to reach a broader audience. Above: the customer’s path to purchasing your product or service. The buying cycle graphic above guides our process for building a marketing strategy and is based on this principle that marketing messages should be tailored to meet the intention of the consumer. Our solutions paired with this consumer-centric process will guide your most valuable target audience to see, think, do, and love. Our audience, data, people and process are at the core of our influence. This foundation is combined with a selection of cutting-edge products and services that best fit your business goals. Plus, we’re local, making communication an collaboration easy. Experience what it’s like to have Advantage Digital in your corner.